Last week, Local 400 members from the Annapolis Police and Takoma Park Police participated in the Police Plunge to support Special Olympics Maryland. The officers joined nearly 800 participants in the event on Friday, January 25, as part of the Maryland State Police Polar Bear Plunge taking place last week. The frigid dives into the Chesapeake Bay raised hundreds of thousands of dollars overall, while the Annapolis Police Department alone raised more than $12,000 in about 12 hours. All proceeds benefit athletes with Special Olympics Maryland. Led by Local 400-backed candidates, the critically important 2018 mid-term elections resulted in major victories for working families. Pro-worker forces recaptured control of the U.S. House, with Virginia front and center. Three candidates recommended by Local 400 — Elaine Luria (2nd), Abigail Spanberger (7th) and Jennifer Wexton (10th) — all defeated anti-worker incumbents. These victories alone accounted for more than 10 percent of the seats won nationally to gain a majority. Three senators backed by Local 400 were re-elected: Tim Kaine in Virginia, Joe Manchin in West Virginia and Ben Cardin in Maryland. Local 400 won key local races, as well. In Washington, D.C., Councilmember Elissa Silverman was re-elected to her at-large seat despite facing a strong challenge from a corporate-backed candidate. And Marc Elrich won a landslide victory in his race for Montgomery County Executive over two opponents, one of whom was lavishly funded by developers. In Maryland, while endorsed candidate Ben Jealous lost his race for governor, Democrats maintained veto-proof majorities in the state House and Senate, which means that pro-worker legislation can still become law even over the opposition of re-elected Gov. Larry Hogan. In West Virginia, pro-worker forces gained seats in the state House and Senate, but not enough to win control of either body. In total, of 165 candidates recommended by Local 400, 125 won, 36 lost and four are in races yet to be decided. 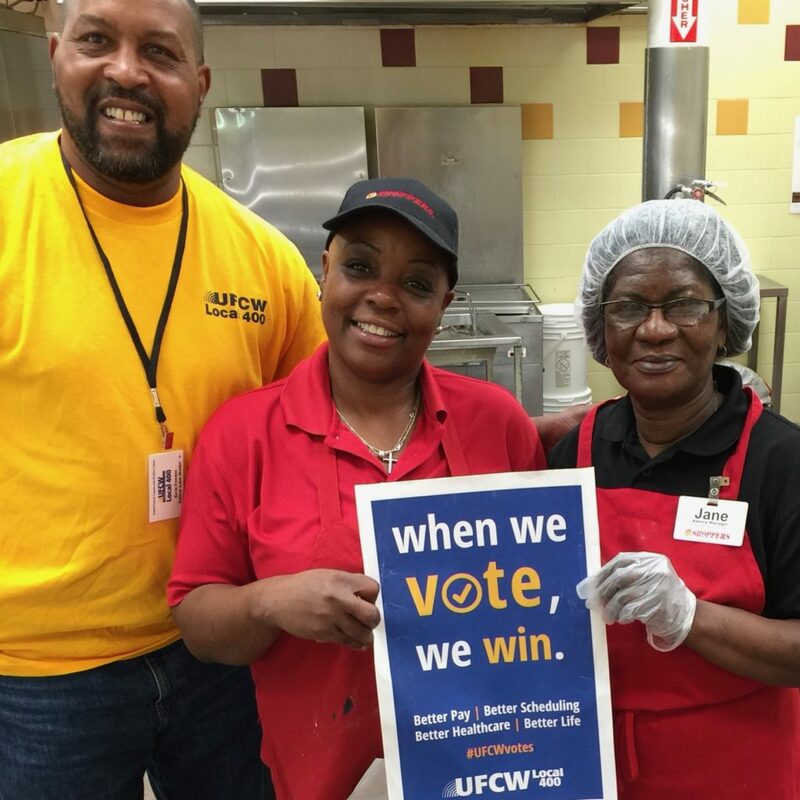 “I couldn’t be more proud of the hard work put in by Local 400 members to elect candidates who will fight for us, and against billionaires and big business,” said Local 400 President Mark P. Federici. “By pounding the pavement, working the phone banks, and getting people out to the polls, our members played a central role in winning back the U.S. House and making gains at every other level of government. This will have important consequences over the next two years in passing legislation that benefits our members and blocking efforts to harm working families. “I want to congratulate all of our recommended candidates, whether they won or lost, for having the courage to fight for what’s right and to stand up to the big money that’s poisoning our politics,” Federici said. Election Day is Tuesday, November 6, 2018. This is one of the most important elections in recent history. Make sure your voice is heard and make a plan to vote! Your vote is a personal decision. As your union, it is our job to recommend candidates who share our values and will fight to make a better life for our union family. We have endorsed the following candidates for office because we believe they will fight on behalf of our members and all working families. Visit Vote.org to find your polling place and learn everything you need to vote on Tuesday, November 6, 2018. Local 400 recommends candidates for office only after an exhaustive process of getting to know them, analyzing their records, and reviewing their positions on issues impacting our members’ lives. These issues include jobs, the economy, workers’ rights, health care, retirement security, workers’ compensation and education. We recommend those candidates judged to have your best interests in mind. Review the voting records of incumbents on labor issues. Participate in the AFL-CIO interview process and schedule one-on-one interviews between Local 400 and many of the candidates. Discuss with other union members and leaders the interviews and the written questionnaires candidates submit. Make recommendations to the executive boards of the relevant area labor councils. Participate in state AFL-CIO meetings, where delegates from Local 400 and other unions vote to give labor’s recommendation to a limited number of candidates. After acceptance, these recommendations are communicated to Local 400 members. 27th Thomas V. Mike Miller, Jr.
8th Donald S. Beyer Jr.
UFCW Local 400 is one of the largest private sector labor unions in the region. 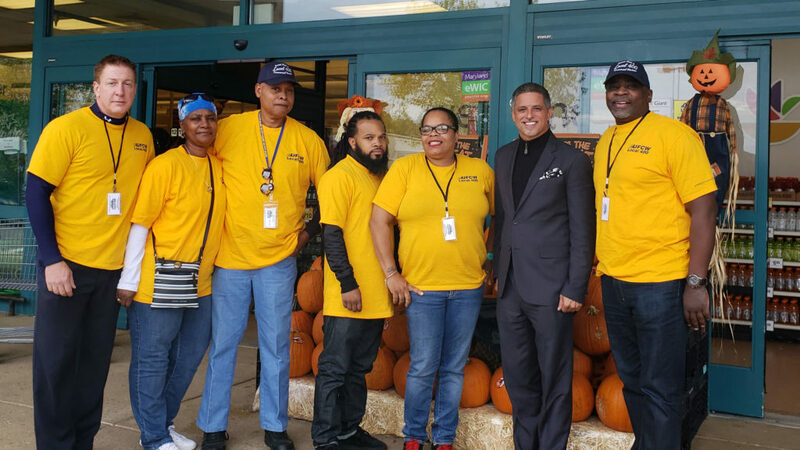 In Prince George’s County, the union has approximately 4,800 active members predominantly working in Safeway and Giant Food grocery stores. Marc Elrich (right) poses for a photo with Safeway #1956 shop steward Sharon Glaser. After years of leading many fights for working families—including passage of a $15/hour minimum wage—Montgomery County Councilman Marc Elrich more than earned Local 400’s enthusiastic recommendation in his campaign for Montgomery County Executive. Local 400’s support in the June 26th primary helped Elrich win a narrow victory over a wealthy opponent who spent $5.4 million. Normally, the Democratic nominee is all but assured of victory in the general election in deep blue Montgomery County, but Elrich’s courage in championing workers earned the hostility of developers and other wealthy special interests. They have taken unprecedented action to try to stop him by convincing a pro-business county councilmember, Nancy Floreen, to enter the race as an independent. Elrich is abiding by the County’s public financing law, which prohibits corporations from donating to his campaign and requires him to raise small donations from county residents. Meanwhile, Floreen is using public financing in order to take advantage of all the special interest money flowing her way. As a result, Elrich will be outspent. It will take people to put him over the top. 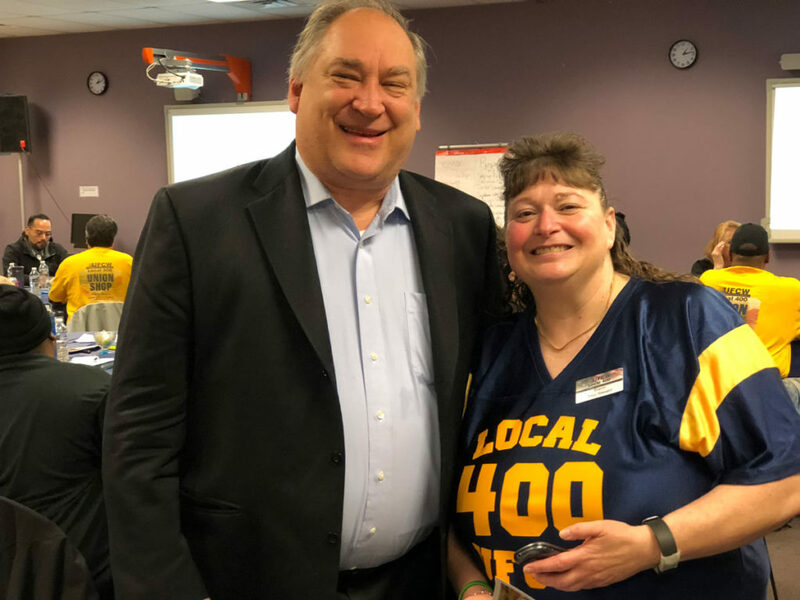 “On every issue that matters, from the $15 minimum wage to paid family and sick leave legislation, Marc Elrich has stood with us,” said Local 400 President Mark P. Federici. “Now, we must stand with him. As Elrich has noted, ​“Raising the minimum wage has already tangibly improved the lives of over 100,000 people and will continue to improve those lives and more in the years to come. An adequate minimum wage is life-altering for families and disproportionately benefits women and people of color. As a Montgomery County public school teacher for 17 years, I also know that the biggest barriers to students’ success are the inequalities that impact their lives, and that raising the minimum wage is thus particularly important for children. “I have sponsored two successful minimum wage increases,” he added. “Several years ago, I helped convince lawmakers in Washington, D.C., Prince George’s County, and Montgomery County to join forces and push for higher minimum wages together. I then championed the cause of the workers behind the Fight For $15, and we succeeded last year in passing legislation that will gradually increase Montgomery County’s minimum wage to $15 an hour. “My vision is a modern economy that encourages entrepreneurship, moves people and goods efficiently, develops today’s and tomorrow’s workforce, ensures regulations are sensible, and promotes opportunity for all,” Elrich said. Election day is Tuesday, November 6, 2018. Early voting takes place from October 25th through November 1st. 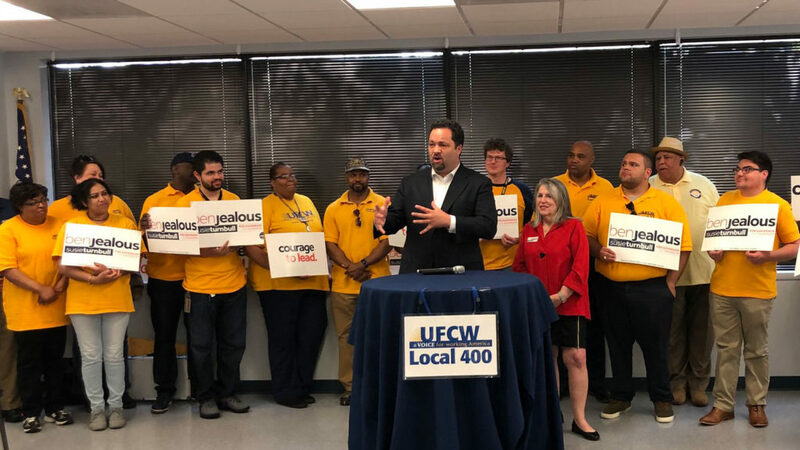 Local 400 members living in Maryland would benefit greatly if they help elect Ben Jealous (D) their next governor, because he will fight for a $15 minimum wage, debt-free college tuition, bottom-up economic growth, universal health coverage, and a host of other pro-worker policies. By contrast, Gov. Larry Hogan (R) has repeatedly vetoed legislation our members need, like the Healthy Working Families Act. Fortunately, at Local 400’s urging, the General Assembly overrode Hogan’s veto and made paid sick leave state law. That’s why Jealous, the former National President & CEO of the NAACP, received Local 400’s enthusiastic recommendation for his campaign to unseat Hogan. Raising the minimum wage to $15/hour and tying it to the state’s median wage, while also gradually eliminating the sub-minimum wage for tipped workers. Implementing an economic policy that increases wage growth, supports small businesses, and expands prosperity across every sector and region of the state. Ensuring that the more than 300,000 Marylanders who currently lack health care are covered through a Medicare-for-All system that delivers better care for less cost. Making community college free for every Marylander and making all four-year public colleges debt-free for state residents. Vetoed the Healthy Working Families Act, which would have denied paid family leave to workers in the state had the General Assembly not overridden his veto. Opposes a $15/hour minimum wage. Let health insurance premiums in the state rise by a whopping 120 percent, while opposing efforts to lower prescription drug prices. Rejected needed increases in school funding. He tried to cut $144 million from Maryland’s public schools in his first budget. In 2016, he pushed to cut $30 million in investments for after-school programs, college preparation, and teacher retention. And he has diverted $18 million from public schools to subsidize expensive private schools. Allowed Maryland workers to fall behind their counterparts, taking home less than $1,000 in inflation-adjusted wage growth during his time as governor while workers nationwide took home more than $5,500 in wage growth, and Virginia workers gained an additional $8,000. 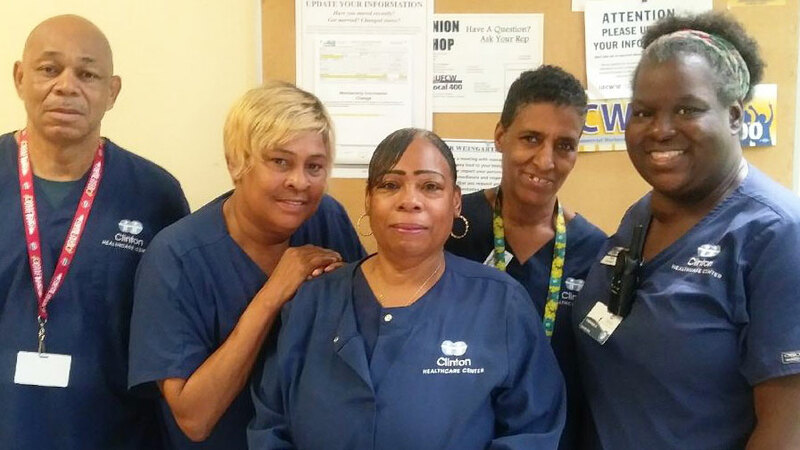 From left to right: James Smith, Joyce Jackson, Claudene Fletcher and Dora Young, along with shop steward Tawanna Gray, received $1,500 in back pay after filing a grievance at Clinton Healthcare Center. Like most Local 400 members, the contract covering employees at the Clinton Healthcare Center in Clinton, Md., requires scheduling to be based on seniority. Workers with the most seniority are scheduled for 10 days in each two week period, and those with less tenure might find their hours more varied, based on staffing needs. So Tawanna spoke with her Local 400 representative, Heather Thomas, who filed a grievance on behalf of Clinton employees against management. At first, progress was slow. But then a new general manager was hired who recognized the company was in the wrong and who worked cooperatively with Local 400 members to put things right. The total amount of back pay was nearly $1,500 for the five members who had been wrongfully denied their hours — Claudene Fletcher, Joyce Jackson, Rose Proctor, James Smith and Dora Young. “I didn’t get any money back myself, but I was so happy for everyone who did,” Tawanna said. “The people who deserved it got it. And they were very, very grateful. Pictured left to right: Johnie Perry, Local 400 Representative; Ofc. Deborah Sauriol-Inoni; Cpl. Hil O’Herlihy; and Det. Aaron Stein. 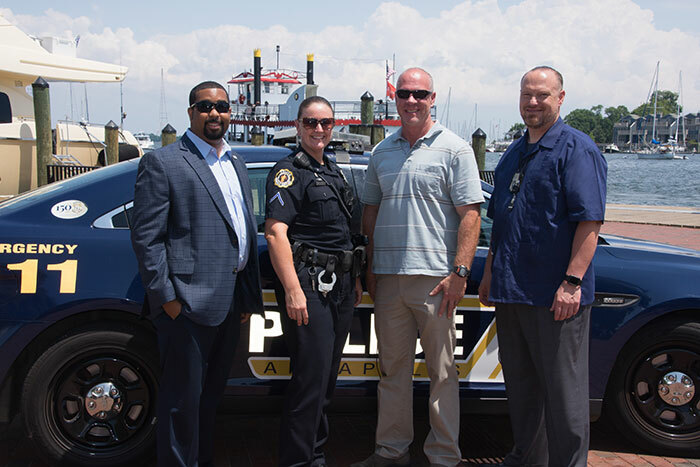 Annapolis Police Officers represented by Local 400 recently ratified a strong new contract that addressed their top priorities and improved the recruitment of qualified candidates by enabling all officers to receive take-home vehicles and reducing the time needed to receive full pensions from 25 to 20 years. The negotiations took an unusually long time because a new mayor was elected and the city manager and finance director both resigned in the middle of contract negotiations. But the officers stayed strong and won on all the key issues before them. Half of all officers will receive a take home vehicle in 2019 and the other half will receive them in 2020. The city will purchase more than 40 additional vehicles to make this possible. All officers will be eligible to receive full pension benefits after 20 years, including those hired after 2012, who had previously been on a 25-year schedule. Members will receive cost of living increases totaling 5.5 percent in addition to any step increases. 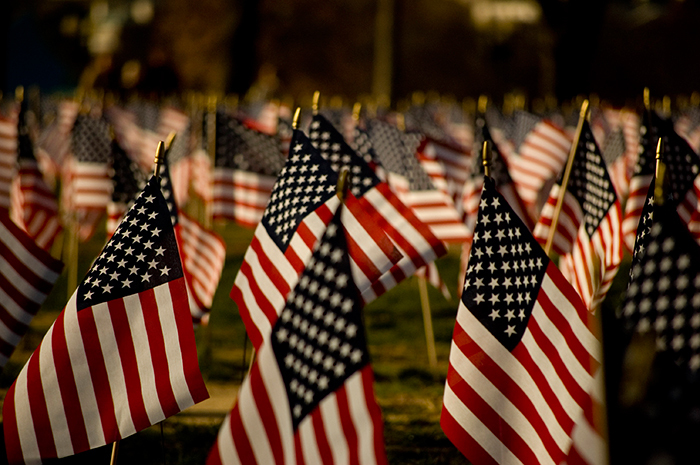 Military members will receive 120 hours of leave instead of “two weeks” for annual training. Members will be eligible to accumulate 120 hours of compensatory time, up from 80 hours. Key language surrounding Detective on call, SWAT team response and Field Training pay were included in the contract for the first time. In addition to their solidarity and perseverance, the members benefited from the fact that competition is fierce to hire qualified police officers. Local 400 members serving on the Annapolis Police Force persuaded city management that the take-home cars and improved pension benefits were essential to the Department’s ability to be fully staffed with the best possible officers in the future. When the horrific mass shooting took place at the Annapolis Capital-Gazette on June 28th, Local 400 members serving as Annapolis police officers were the first to respond. Even though the newspaper’s offices are outside the city borders in Anne Arundel County, Annapolis police officers were near the scene and arrived first. Not knowing what they would find, they charged into an active shooter situation, found and subdued the shooter, and worked to help the victims until emergency medical personnel arrived. “My fellow officers went right in to the scene with no hesitation,” said said Corporal Hil O’Herlihy, Local 400 chief steward. “They ran towards the shooter and eventually placed him under arrest. They followed their training and their performance under the worst of circumstances couldn’t have been more impressive. Five Capital-Gazette journalists tragically lost their lives that day. But had it not been for the courage of Local 400’s Annapolis police officers, the outcome could have been even worse. They deserve our thanks and our admiration. Marcia Williams was awarded full back pay after being unjustly sent home from her job at Peapod in Hanover, Maryland. Marcia Williams’ husband calls her every day during her 30-minute break, just to check in and see how her day is going. “Because he loves me,” she says. Marcia has worked as a stocker for Peapod for almost three years and according to shop rules, she’s allowed to have her phone with her on the floor. She can even listen to music with one earbud, but phone calls must take place in the break room. One day in March, Marcia wasn’t watching the clock and realized that she had worked ten minutes into her break when her phone rang. She answered as she hurried toward the break room, explaining to her husband that she had missed the start of her break and she would call him back as soon as she got to the break room. She looked up to see her supervisor watching her. “I wasn’t even on his time, I was on my time,” she says, but even after explaining the situation to three different supervisors, Williams was sent home for the remainder of her shift. Aretha immediately got to work and filed a grievance. 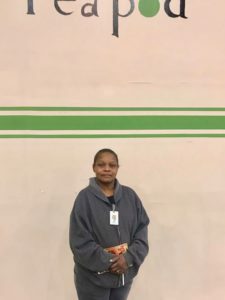 In less than a week, Marcia received notice that she had won her case and would be receiving back pay for the hours that she should have been working. To ensure the problem didn’t happen to anyone else, Aretha went even further. She worked with Peapod to completely rewrite the cell phone policy to include a progressive discipline process. Progressive discipline is the idea that disciplinary action taken against you by your employer must gradually increase in severity. The new policy requires supervisors to first issue a warning before taking more drastic action. An employee cannot be suspended or sent home until they have been warned at least once, and an employee can’t be terminated without first having been suspended. Progressive discipline is a cornerstone of union workplaces and ensures everyone is treated fairly. If she hadn’t been a union member, Marcia would have had no recourse. But thanks to her union contract, Marcia was awarded back pay for unjustly being sent home. It’s just another one of the reasons a union contract is the best protection you can have on the job. Darius Smith, who served on the union bargaining committee, addresses the crowd at a Giant Food mass meeting in Washington, DC. Two years ago, Darius Smith, a courtesy clerk at Giant #347 in Kettering, Md., was looking for a new job. He was feeling underappreciated, and he often found himself doing tasks that were not in his job description. He thought maybe he had simply gone as far as he could with Giant Food. But when he talked to his union representative, Heather Thomas, about job opportunities at the union, she had another idea. She told him about the collective bargaining process and asked him to join the bargaining committee, and Darius agreed. He realized that perhaps his work at Giant was not done yet. 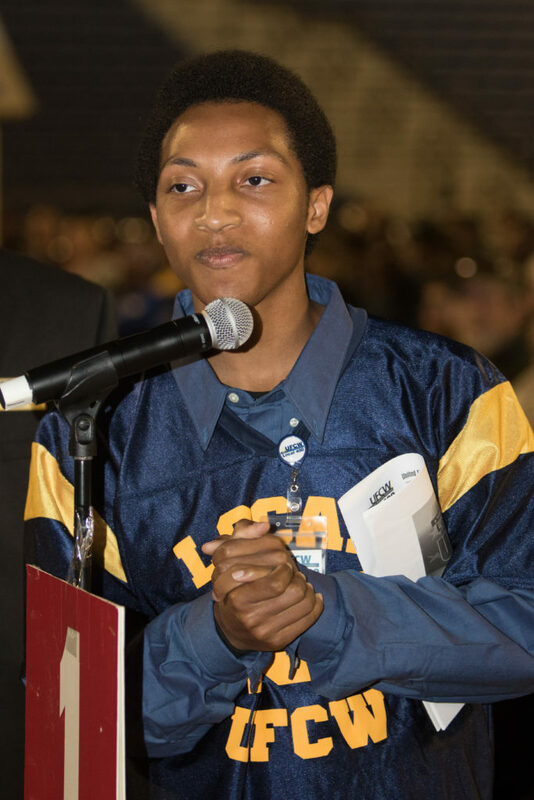 In April, Darius attended the bi-annual Labor Notes Conference in Chicago with other Local 400 members. He expressed his frustrations about his new job to UFCW Local 400 Mobilization Director Alan Hanson. Darius told Alan about how he and his co-workers were being asked to take on larger tasks than they could handle; how some of his co-workers, many of whom are immigrants, felt that their employer was guilty of discrimination; and how, in January, the World Bank had started cutting hours of both full-time and on-call employees without warning or explanation. “The World Bank is about ending poverty all over the world but if you look at how they treat us it’s completely hypocritical,” Smith says. Alan put Darius in touch with UNITE HERE Local 23, which primarily represents workers in the hospitality industry. It seems this was true of most of his co-workers, 89% of whom voted to join the union in June. But Darius knows from his experiences with Giant that the fight is far from over. “I really look forward to bargaining with the company, having everyone come together to formulate a better contract,” he says. Along with experience and knowledge of the bargaining process, Darius’ contributes a great amount of spirit to his bargaining unit. “At Giant we had a lot of faith, and I think I can bring that, helping people keep faith, keep strong, keep motivated,” he says. His experience as an assistant pastor at Hope in Christ Ministry helps him do this. It also helps him connect with his co-workers at the World Bank, one of whom is a priest and many of whom he believes to be similarly motivated by faith. Darius hopes to be on the World Bank bargaining committee, and though formal listening sessions haven’t started yet, it seems that one of his greatest strengths is that he is always listening. He’s already gotten a lot of insight from co-workers about what their demands are, and he says that being part of Local 23 has given him an idea of what wages and contracts look like throughout the industry. But for Darius, being part of a union means more than a new and improved contract. “When you’re part of a union you have something to look up to,” he says.